The hunt for Malaysia Airlines Flight 370 entered a new phase as authorities moved the search area to an area of the southern Indian Ocean. SYDNEY—The hunt for Malaysia Airlines Flight 370 entered a new phase on Thursday as authorities moved the search area for the third time in as many months, focusing on an area of the southern Indian Ocean buffeted by fierce winds and storms. Authorities concede that the decision to move to an area as much as 600 miles south from where ships and planes have been deployed since early April was based on educated guesswork, given the limited data about the final movements of Flight 370 after it went missing on March 8 with 239 people on board. The shift comes as private contractors ready plans to take over what would be the largest undersea search mission in history, with a deadline for bids on Monday. Authorities are offering up to 60 million Australian dollars (US$56 million) for a company or research organization to carry out a search over 20,000 square miles of remote ocean using sonar equipment that may take as long as 300 days to complete. The Australian Transport Safety Bureau aims to spend around four weeks reviewing the bids before selecting a contractor to lead the rebooted search. That contractor will then have only a month to mobilize crew, equipment and ships from around the world to the new search area ahead of a restart in August. The new search area runs from the South East Indian Ridge in the south—a narrow area of sea that has been mapped by U.S. researchers in the 1990s—through a deep abyssal plain to just west of the Broken Ridge, which is in places as shallow as 3,250 feet. 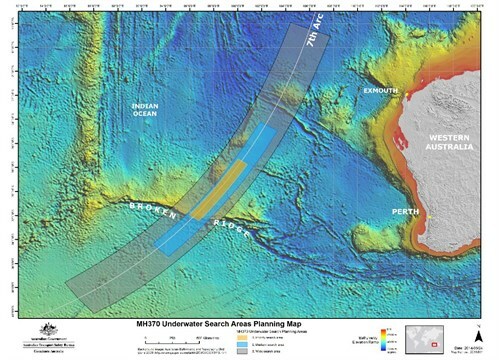 Today Australia, Malaysia and China announced the search area in the southern Indian Ocean, which represents the highest priority for future search efforts for missing Malaysia Airlines flight MH370. An expert satellite working group has reviewed all existing information in order to define a search zone of up to 60,000 square kilometers along the arc in the southern Indian Ocean. 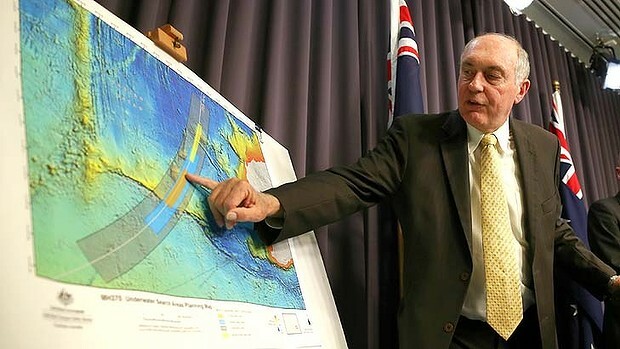 Deputy Prime Minister and Minister for Infrastructure and Regional Development Warren Truss said the latest search area refinement had involved the efforts and expertise of specialists from around the world. “Specialists have analysed satellite communications information—information which was never initially intended to have the capability to track an aircraft—and performed extremely complex calculations,” Mr Truss said. “The new priority area is still focused on the seventh arc, where the aircraft last communicated with satellite. We are now shifting our attention to an area further south along the arc based on these calculations. 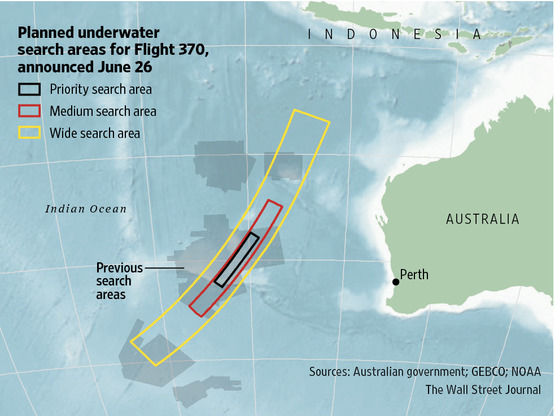 Deputy Prime Minister Truss said the search for MH370 continues with a bathymetric survey—or mapping of the ocean floor—in the search area, to be followed by a comprehensive search of the sea floor. “The bathymetric survey has already commenced, with the Chinese survey ship Zhu Kezhen and the Australian-contracted vessel Fugro Equator conducting operations in the areas provided by the Australian Transport Safety Bureau,” Mr Truss said. “It will take around three months to complete the bathymetric survey. It is expected that the underwater search will begin in August and take up to 12 months to complete. SYDNEY (AP) — The hunt for the missing Malaysia Airlines plane will shift farther south of the most recent suspected crash site in a remote stretch of Indian Ocean, Australian officials said Thursday. They also said they were confident that the plane was flying on autopilot when it crashed. Martin Dolan, chief commissioner of the Australian Transport Safety Bureau, said "certainly for its path across the Indian Ocean, we are confident that the aircraft was operating on autopilot until it ran out of fuel." Truss said officials have not attempted to fix a moment when the plane was put on autopilot. The 239 passengers and crew on missing Malaysia Airlines flight 370 likely died from suffocation and coasted into the ocean on autopilot, a new report says. Australian investigators revealed details of the 55-page report Thursday, suggesting that the Boeing 777 probably ran out of oxygen, causing all onboard to suffer from fatal hypoxia, Reuters reported. The plane remains missing and there is no new evidence, but Australian Safety Board investigators came to the conclusion by comparing the flight with previous disasters with similar outcomes. “Given these observations, the final stages of the unresponsive crew/hypoxia event type appeared to best fit the available evidence for the final period of MH370's flight when it was heading in a generally southerly direction,” the report said. Investigators believe the plane was deliberately diverted thousands of miles from its scheduled route before finally diving into the Indian Ocean. The little evidence there is to go on suggests the plane crashed further south than previously thought, and was likely coasting on autopilot at the time of the crash. "It is highly, highly likely that the aircraft was on autopilot otherwise it could not have followed the orderly path that has been identified through the satellite sightings," Australian Deputy Prime Minister Warren Truss told reporters in Canberra Thursday. ''The search will still be painstaking … We could be fortunate and find it in the first hour or the first day. But it could take another 12 months,'' he said. Based on the map released by the bureau of the presumed flight path, MH370 appears to have changed direction three times between taking off from Kuala Lumpur and setting its final course towards the Indian Ocean where officials believe it came down. Mr Dolan refused to say whether the new information made foul play more or less likely, insisting that was a matter for the Malaysian authorities. Australian authorities were responsible only for the search, he said. Warren Truss: Well ladies and gentlemen, welcome. I am joined today by Martin Dolan, who is the Chief Commissioner of the Australian Transport Safety Bureau. It has now been over 100 days since Malaysia Airlines flight MH370 disappeared from air traffic control radar after taking off from Kuala Lumpur. At the request of the Malaysian Government, Australia has been leading the search of this, as the aircraft is thought to be resting in Australia's air search and rescue area. The search remains a highly complex operation and involves vast areas of ocean, and can rely on only limited data and aircraft flight information. Air crash investigators probing the disappearance of Malaysian Airlines MH-370 have discovered possible new evidence of tampering with the plane’s cockpit equipment. A report released by Australian air crash investigators has revealed that the missing Boeing 373 suffered a mysterious power outage during the early stages of its flight, which experts believe could be part of an attempt to avoid radar detection. The reports says the log-on request-known as a “handshake”-appears likely to have been caused by an interruption of electrical power on board the plane. The aircraft experienced another such log-on request almost six hours later, though this was its seventh and final satellite handshake and is believed to have been caused by the plane running out of fuel and electrical power before apparently crashing, somewhere in the southern Indian Ocean. He said the interruption would not have caused an entire power failure but would have involved a “conscious” attempt to remove power from selected systems on the plane. Any form of power interruption is always backed up by another system. KUALA LUMPUR, June 29 — Datuk Seri Dr Liow Tiong Lai's maiden task as Transport Minister should be to form an independent body to investigate the mystery surrounding MH370, which has been missing for almost four months now, PKR's Nurul Izzah Anwar said today. She said the investigation panel should consist of air crash experts from around the world, pointing out that Malaysian officials have yet to come up with any plausible theory or explanation with regards to the missing Malaysia Airlines flight. “One of the main responsibilities of the minister is to form an independent investigative body for the MH370 incident,” she said in a statement here. MALAYSIA Airlines only twice attempted to make phone contact with its unresponsive airliner over six hours as it flew to its doom, causing vital clues to its final location to be lost and painting a woeful picture of air safety in the region. The revelations come out of close examination of an Australian Transport Safety Bureau report into MH370’s disappearance, released on Thursday. 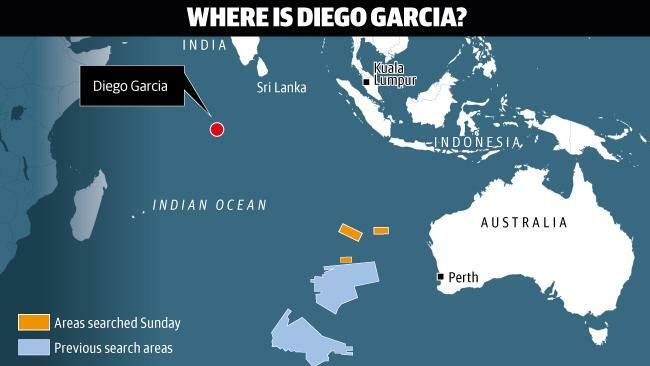 The report also shows that no one in the cockpit used aircraft waypoints to set course south over the Indian Ocean, ruling out suspicion that pilot Zaharie Ahmad Shah had pre-programmed the Boeing 777 to crash. But this did not eliminate suspicion that someone used the automatic pilot to send the plane on a southerly heading. Veteran serving Qantas pilot Richard Woodward, who flies A380s but has test-pilot experience on 777s, said if ground crew or air-traffic control had inundated MH370 with phone contact attempts it would have given a clearer picture of where the plane went down. Satellite provider Inmarsat and investigators calculated the early Indian Ocean search areas based on automatic satellite “handshakes”, initiated by an Inmarsat ground station in Perth, but also from phone calls made from the ground to the cockpit satellite phone that went through the same ground station. “If they’d been calling the plane, the satellite would have tried to log on and the aircraft pinger would have tried to respond,” said Captain Woodward. Instead, after pilots made their final contact at 1.22am, Malaysian time, on March 8, it would be another hour and 17 minutes before ground staff first tried to ring the plane’s satellite phone. Astoundingly, despite receiving no initial response, no one tried to ring the plane again for another five hours. The next call came at 7.13am Malaysian time, after the flight was supposed to have landed. “Five hours is a long time (not to call) if you’re trying to search for the airplane,” said Captain Woodward. “You’d be trying every available means. I’m absolutely surprised there’s only two attempts to call on the satellite phone. Captain Woodward does not rule out intervention from pilots or hijackers, because he believes if there was a fire aboard the pilots would have had time to put on oxygen masks and declare a mayday. He says the pilots could have been overcome by hijackers but, given difficulties of accessing the cockpit’s secure door, it was more likely the result of aberrant behaviour by the flight crew. “I’m leaning towards to fact a rogue pilot, probably the captain, planned all this,” he says. KUALA LUMPUR: Claims by Australian air crash investigators that a mysterious power outage was involved in the disappearance of Malaysia Airlines Flight MH370 are mere speculations, said Defence Minister Datuk Seri Hishammuddin Hussein. He said the Malaysian Government would only rely on reports released by the Joint Agency Coordination Centre (JACC) when it involves MH370. "Any issues, we have panel experts to verify it. The report is not from JACC .... JACC is Australia's counterpart to the Malaysian Government linked up with China. "Anyway, I will treat any latest information the same way as I have done in the past, let it be verified by JACC. All this while, we have not stopped our search for the black box and any new information on the flight," he told reporters after a special Cabinet briefing with regard to Flight MH370 in Parliament, here, on Tuesday. Also present was Transport Minister Datuk Seri Liow Tiong Lai. SYDNEY—Australian authorities said they believe that someone onboard Malaysia Airlines 3786.KU -4.35% Flight 370 switched on the autopilot system deliberately after the plane turned toward the southern Indian Ocean. They also theorized that all 239 passengers and crew had become unresponsive, possibly after being deprived of oxygen, before the plane ran out of fuel and crashed.